Conveniently situated next to its own private beach, Camping Rubicone is a beautifully maintained campsite that’s perfect for family groups. Nestled on the stunning Adriatic Sea, near the coastal resort of Rimini, the grounds of this luxury camping site are carefully landscaped with lush greenery and colourful flowerbeds. All the amenities are located centrally, with a well-stocked supermarket, cash machines, sports facilities and a huge pool for the use of guests. 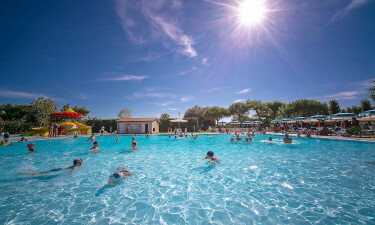 To find out more about the accommodation on offer at Camping Rubicone, and to book a relaxing break in a mobile home, just get in touch with LUX-camp today. 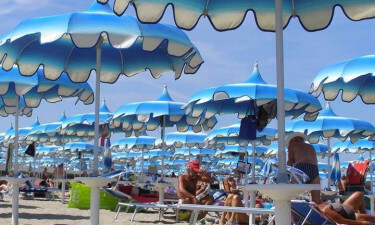 Why stay at Camping Rubicone? Whether guests prefer to swim in the warm, clean waters of the Adriatic Sea or in an azure pool, Camping Rubicone has it covered. The sandy beach has plenty of room at any time of year; there are sun loungers and parasols for hire, and a convenient bar selling refreshments. The pool complex is large and fringed with comfortable recliners, ideal for topping up a tan. A separate pool for children has a fountain and fun water slides. No luxury camping holiday would be complete without a schedule of exciting evening entertainment and at Camping Rubicon there are shows to suit everyone in the amphitheatre. 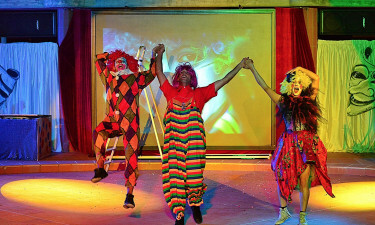 Expect a variety of acts, from singers to acrobats and dancing troupes, and performers juggling firebrands. The site also provides evening activities for younger children, with discos and shows put on by younger staff members. Children will appreciate the large playground in this section of the park, but there are also many facilities aimed at adults on a luxury camping holiday. The golfing green is ideal for a few practice shots, the archery course offers free courses and the tennis courts are perfect for all levels of player. With an authentic wood-burning pizza oven, the Pizzeria restaurant is very popular with guests on a camping holiday. Fresh pizzas are cooked to order, and they can be eaten on the pretty terrace area or taken away. For dessert, there’s an ice cream parlour serving up indulgent treats made with traditional Italian gelato. This luxury camping site also boasts 3 further bars, each stocked with local spirits and European beers. The supermarket at Camping Rubicone offers excellent value for money and is stocked with a wide range of food and drink. There is a butcher and delicatessen, a variety of freshly made breads, plus vegetables and fruits. Snacks, tins and dried foods are also available, so it’s easy for guests to do all their shopping on site.